Biographical sketch: St. Thomas University philosophy professor Leo Charles Ferrari, son of Leo Francis and Millicent Josephine (Müller) Ferrari, was born in Bathurst, New South Wales, Australia on 8 December 1927. He received his early education at St. Patrick's College (Christian Brothers' Colleges), Strathfield, later graduating with a B.Sc. from the University of Sydney in 1948. For seven years he worked as an industrial chemist and studied medieval philosophy at night. In 1955 he emigrated to Canada to commence advanced studies in philosophy at Laval University, earning a L.Ph. and Ph.D. in 1956 and 1957 respectively. Following graduation, Ferrari accepted a position as lecturer with St. Mary's University, Halifax (1957-58) and later as assistant professor with Mount St. Vincent University, Halifax (1958-61). Ferrari began his 34-year association with St. Thomas University in 1961, joining the faculty to lecture in philosophy. In 1964 he relocated from Chatham to Fredericton when St. Thomas moved into new facilities on the University of New Brunswick campus. Active on a number of university committees, he was the first chair of the Executive Committee of St. Thomas Faculty Association (1965), later renamed the Faculty Association of the University of St. Thomas (FAUST). 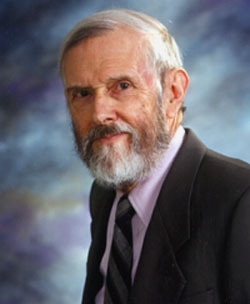 In 1970 UNB appointed him Honorary Research Associate of the Graduate School, and a year later St. Thomas elevated him to the rank of full professor. Recognized internationally as an authority on Augustine of Hippo, Ferrari published over 35 works on the 5th-century bishop-philosopher and presented a number of academic papers on him at conferences and conventions. In 1982 he was invited to deliver the annual Saint Augustine Lecture at Villanova University, Villanova, Pennsylvania. A substantial work, Concordantia in libros XIII confessionum S. Aurelii Augustini, the first published concordance to the Skutella text, was published jointly with Rodney H. Cooper, Peter M. Ruddock, and J. Robert Smith in 1991. Ferrari retired from university teaching in 1995. At spring convocation 1998, he will be named first professor emeritus of St. Thomas University. Outside scholarly pursuits, Ferrari took an active role in the community, sitting on the executive committee of several societies and organizations. For a number of years he served as president of The Flat Earth Society, an organization dedicated to renewing "faith in the veracity of sense experience," which he helped found. In addition, he wrote several articles for the New Brunswick Human Rights Commission on the subject of racial discrimination. He also acted as president of both Grosvenor Park Home and School Association, Halifax (1960-61) and Kingsclear Home and School Association, York Co., N.B. (1964-67), and he chaired the Centennial Committee for the New Brunswick Home and School Federation (1965-67). For several years, Ferrari was an exhibiting member of the Fredericton Society of Artists. In 1997 he lives in Fredericton with his wife Lorna E. Drew. Scope and content: This fonds documents the academic activities of philosophy professor Leo Ferrari, particularly with respect to his studies of 5th-century bishop, philosopher and doctor of the church Augustine of Hippo. It also documents his activities as president and primary spokesperson for The Flat Earth Society (FES), an organization founded to encourage critical thinking and restore confidence in the validity of the senses. In addition, this fonds reflects Ferrari's interest in human rights issues. It includes incoming and outgoing correspondence, notes, research material, draft and published copies of books and articles, bibliographies, and conference programmes. In connection with The Flat Earth Society, it includes letters from applicants, membership lists, tractates, photographs, copies of The Official Chronicle and The Official Organ, cartoons, newspaper clippings, brochures, and financial records. It also contains a reel-to-reel audio tape of Ferrari speaking about the FES and a VHS videotape entitled "In Search of the Edge". Artifacts include a smashed globe, maps of the world in various shapes, framed membership certificates, and a wooden gnome holding the sign "Repent! the Edge is Nigh". This fonds consists of 4 series: 1) academic writings, 2) The Flat Earth Society, 3) artifacts (The Flat Earth Society), and 4) sabbaticals and conferences. The bulk of the material comprising this fonds was deposited with Archives and Special Collections Department, Harriet Irving Library by Leo C. Ferrari on 15 March 1995. Several artifacts and a VHS video were deposited by him in May 1995. A few draft manuscripts as well as research and academic files were also deposited by Professor Ferrari on 28 November 1997. A few files were created by the archivist. For the most part, the original order and titles of files have been retained. The archivist has annotated a number of file titles; these annotations appear in square brackets.